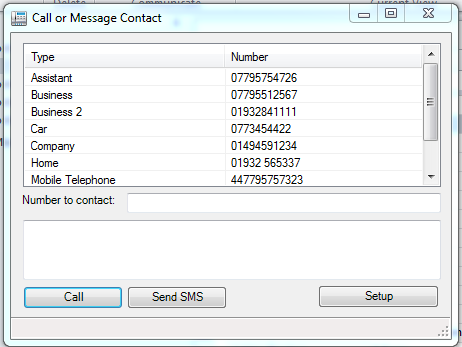 Having played around with the Gradwell API a little bit I decided to write a little addin for Outlook 2010 to make calls and send SMS messages directly without having to use my handset. Which will bring up the same dialog box but you will have to enter or paste a number in to the “Number to contact” textbox. The program will automatically strip any characters that the Gradwell API cannot accept – so you should just be able to press the call or SMS button and the action will take place. Please note that when entering the SMS Originator number it must be a number associated with your account and entered in full international format, e.g. 441932565337. Hi there, many thanks for taking the time to write this add-on and post about it. Does this work like the Broadworks dialer, in that when you initiate a call, your handset rings, you pick it up and then the call is actually ‘sent’? But yes, it works in the same way, you initiate the call and your phone rings and shows the number you have called as calling you. When you answer it then call is then connected to the other party. I’ve also noticed that if I go to Dialling Options and look at “Connect using line” the drop down box is greyed out and clicking on “line properties” bring sup the same error described above. I think you are actually clicking on the wrong option to dial a contact, what version of Outlook do you have? I only say that as the options you are referring to simply do not exist in the add-in that I have made! When you right click on a contact you should have a new option complete separate from Outlooks own dialler which reads “Communicate with Gradwell”. Do you see that? I don’t think it works in Outlook 2013, I need to update it. Two problems. Somehow I had installed it twice and was also looking at the wrong option!! Sorted now – thanks. Yes, it does actually. We are probably going to start using dynamics CRM in house soon so I may look at it then. Or if you are based in the UK, you can hire me to look at it for you, if you are keen to get it done soon. Hi there, I am having trouble getting this app to work, everytime I press call it reports an internal error and suggests restarting the app. 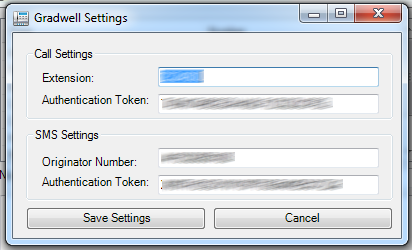 I have added the token on gradwell and put it into settings, along with the extension number. I have noticed that the addon installs itself twice also. Please could you offer some suggestions on how to remedy this as this app will be great when working! I have it partially working now. Under Add-Ins I can click on Communicate with Gradwell and manually enter a number and it will ring. But, none of my numbers/contacts are listed here and when I right click on a contact there isn’t an option for communicate with gradwell. Could this be due to Ofice 2013 or Exchange? It is because of Outlook 2013. I developed it in Outlook 2010. I will change the code this weekend to update it to work with 2013. That is great news! I am very appreciative. It might be a good idea to leave the download for the 2010 version also, as I have a computer using 2010 still and I’m sure others will, unless of course the new version will work on both. We sell certain Gradwell services as a partner under our own brand and I’d be really interested in talking to you about commissioning a version of this tool with our branding instead of Gradwell’s. I would imagine this would be pretty straight forward but perhaps we could discuss this in more detail? An email or phone call would be much appreciated! Just sent you an email. Look forward to hearing from you. Actually I was working on it for a little while on the weekend. It is nearly ready, but I won’t get any more time to work on it until this weekend or early next week. I’m just finishing off quite a large Office 365 migration. Will post as soon as there is any news! Would be cool if you could include an option to add 2 extension and choose the extension when dialling out. Although this is probably too time consuming/complicated from a coding point of view I guess. What are your thoughts? The version that works with 2013 is done now. Would you like to test it out for me before I post generally? Hi there Paulie, many thanks for this addin, looks and works great! Would it be possible to also test the new version? Could you also send me the updated 2013 version – the 2010 version worked really well!